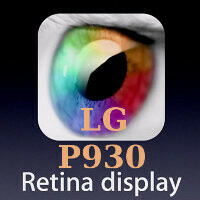 LG P930 coming with 720x1280 screen, pixel density to outgrow Retina Display? The LG P930 might not see the light of day in the next couple of weeks or even months, but we can bet on the fact that LG has already started plotting its next-generation flagship and the LG P930 is one very possible candidate for that throne. 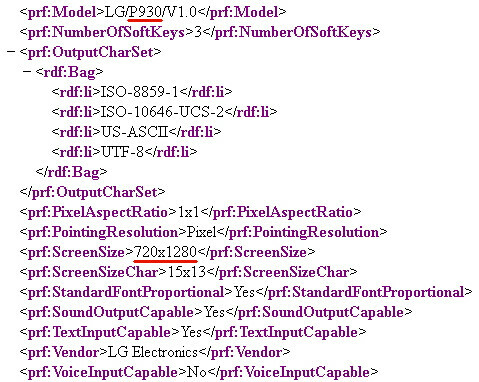 Folks over at UnwiredView have uncovered the mystical Android-running LG P930 in an XML spec file posted on LG’s website, but given the 720x1280 resolution it seemed unlikely that this could be a phone. The P-series in the name however matches LG’s initial for its phone lineup whereas the only tablet of the company – the LG Optimus Pad – carries the V initial in front of its model number. But even more importantly, the ScreenSizeChar attribute in the XML file shows 15 characters fitting in a row and a total of 13 columns, which suggests a handset. A weird handset which puzzlingly seems to have a better resolution, while at the same time fitting less characters. The puzzle got one step closer to being solved after news broke yesterday at screen-centric SID in LA that Toshiba is demonstrating a 4-inch 720x1280 pixel screen boasting a pixel density of the whopping 367ppi, a significant addition to the 326ppi on the iPhone 4. In addition, the company has reportedly mentioned that the new technology will make it to retail this year. Bottomline? This could well be the next big thing from LG in line with the LG Optimus 3D P920, or what seems to be the predecessor of the yet unannounced device in terms of model numbers. The rest of the information in the uncovered XML file brings nothing all that surprising – HSUPA/HSDPA as well as EDGE/GPRS support sounds pretty standard. The device will also come with 3 soft keys. The rest is pure speculation, but some sources are theorizing that this could well be the Google Nexus 3. We’d take this with a huge grain of salt, but we’re surely looking at something interesting, so stay tuned as more information is sure to come out soon. apple will freak and sue over the retina name use... that was Apple's label... jealousy will drive them mad!!!!! LG will not call it 'Retina display'. Google nexus tab will blew ipad out of teh water if it were to have this kinda display. Aren't tehre any update yet on nexus tab? Human eyes only recognize 320ppi and Retina display it's already 326ppi! The above statement is entirely wrong and sounds almost like a Steve Jobs islave pr statement see below http://www.pcmag.com/article2/0,2817,2364871,00.as p Not that fanboys will believe theses findings,Steve Jobs will not allow it! It's been almost a year now, and no phone could match the ip4's resolution. But of course the iphone is playing catch up, lol. Still playing the victim I see. Yes, it is possible that a phone with the highest ppi to still be plying catchup in the eyes of others. But who knows, maybe Apple will revolutionize the industry again with the iPhone 4s or 5.